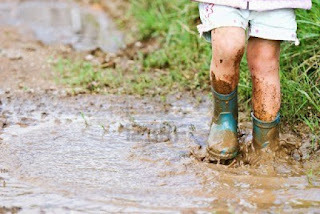 Dancing in the Rain, Stomping in the Mud, & Other Dirty Adventures!!! I take the baby out around ten in the morning every day to play. Monday was like any other day. I asked her if she wanted to go outside & she responded with a simple shake of the head & a “yeah”! We traveled out into the beautiful sunshiny day! It was clean & crisp. The day hinted at the glorious autumn that would soon envelope us. The baby squealed & laughed & tromped about. Even scaring the neighbor’s cat a bit with her big “lion” roars.